I'm always on the hunt for tasty gluten free baked goods. Since discovering the art of baking with almond meal, gf baking has become simpler, moister, and actually quite successful (you wouldn't even know there was no gluten). So far, I've tried cookies, cake and a breakfast bread, but had yet to tackle muffins. My celiac sister had asked me to recommend a banana based breakfast muffin, so I set out to find the perfect recipe. Success! 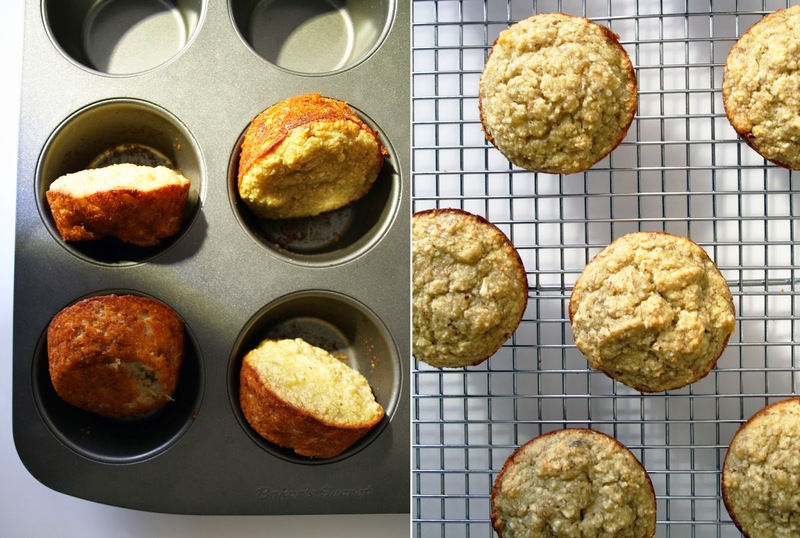 If you only have 1 banana lying around, this recipe can easily be halved - yields about 6 muffins. In a large bowl, beat the egg. Add the 2 bananas and mash well. Add the honey, milk, vanilla and baking powder to the banana mixture and stir to combine. Add the almond meal and oat flour to the bowl and stir just enough to combine. Do not over mix. Allow the batter to rest while you grease the baking pan. Divide the batter into 9 muffin slots. Once cool enough to touch, transfer the muffins to a wire rack and allow to cool completely.